Ovalis, in reconstructed stone, sets a new standard in pillars for modern gate: with its clean lines and curved surfaces, thid product is completely different from standard pillars. Ovalis is used together with smooth wall blocks and rounded copings. 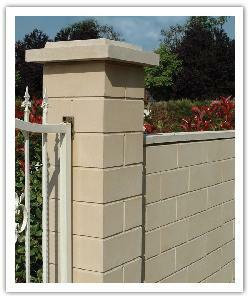 Ovalis elements are designed to interlock for easier laying without jointings. Their hollow core must be filled with concrete.